Any form of potatoes will probably always be top of my list for side dishes or appetizers. Partly from growing up in a potato-farming community and partly because they just taste so darn good. Plus they’re incredibly versatile, so there’s not much chance to get bored with them. Hubby and the kiddos also love potatoes, so they’re in pretty constant rotation with our meals. Mostly we had done mashed, roasted reds, homemade fries, with the occasional hasselback or crash hot potatoes. But then I ran across a new way to dish up potatoes and we have not looked back since. Seriously, once you make these potatoes you’re going to want them all. the. time. Hubby tries to think of meals where I will suggest them as a side because he loves them so much. They’re golden and crispy on the bottom and warm and soft on the inside. My stomach is growling just thinking about them. Pour melted butter in the bottom of a 9x13 pan; turn to coat thoroughly. Generously sprinkle grated Parmesan cheese over the melted butter. Lightly sprinkle ground black pepper over the cheese and melted butter. If desired, sprinkle on other seasonings, like rosemary. Wash potatoes and half lengthwise. Place cut-side down in buttered pan. Bake 45 minutes. Let stand 5-10 minutes before removing from pan so that the crust will completely crisp up. We’ve been serving our Parmesan potatoes as a side to steak, pork chops, and even baked chicken. I also plan to dish them up as an appetizer at some of our upcoming gatherings. Maybe with some ranch, sour cream, or a fancy ketchup (like peach ketchup) for dipping. Don’t worry if you have a few leftover. These potatoes actually taste amazing even when cold. So maybe have a little midnight snack later, or add them to your lunch the next day. YUM! Thank you for sharing this. I am going to make some for dinner this week. These sound amazing!! I am always looking for great side dishes that everyone in the house will enjoy and I think this is one of them!! These look so yummy I almost wish I could grab them right through the computer screen! I love potatoes. They are my weakness especially when seasoned and crispy on the outside. These would be a delicious side for dinner or even a snack. I love this recipe idea. We love potatoes and this would be a hit in our house! These look amazing. I could seriously eat about a dozen right now. oh man, we may just have to make these tonight. drool worthy! These look delicious!!! I am going to try these! They’d be a perfect side to chicken. This recipe looks and sounds delicious. I like the fact that you can eat them cold teh next day for lunch. Those look amaaaaazing! My hubby would be in awe of these! this looks absolutely delicious! i love simple easy ideas for sides! thanks for sharing. Those are literally making my mouth water. They look impossibly good! I have made these before and they were such a hit!! Thanks for reminding me about their awesomeness!! so delish. looks great, I don’t think I have ever made potatoes like this. Oh lordy those look amazing! I’ll be reaching for this recipe when we eat potatoes again! Yum these look amazing! I wish I had all the ingredients to make them tonight! I love potatoes! This looks like such an easy potato recipe! My husband makes these potatoes all the time for a snack! Those potatoes look so amazing. My girls would eat them up. I am going to have to give this recipe a try very soon. Oh MY Gosh! I am always trying to find new potato recipes and I love how simple and delicious this looks! 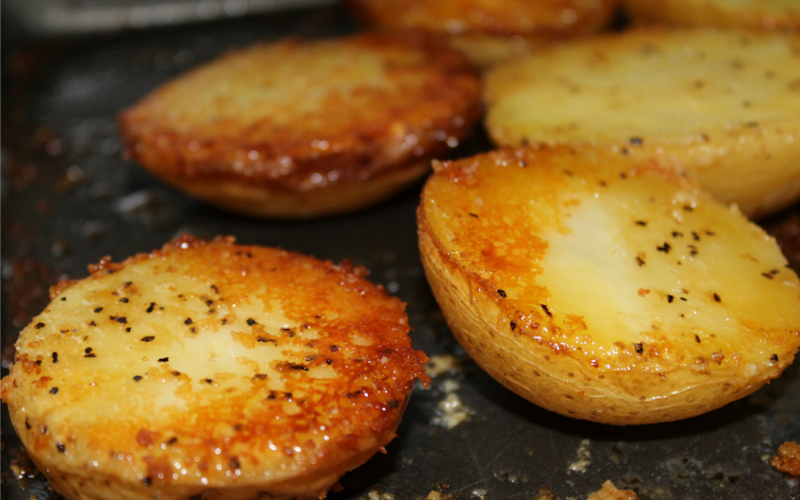 Parmesan + Potatoes = YUM! These look outstanding! I am bookmarking to try for later. This is a snack my son would love! Are each one a half a potato? I thought it looks smaller..like sliced. These look so yummy! Hi Lisa! Yes, they are each a half potato, cut lengthwise. They’re small potatoes, though; not quite baby-sized, but definitely the smaller ones you can find. I actually tried these potatoes and they are AAAAAMAZING! SO SO SO GOOD!! Great recipe! I only had small red potatoes so I used those and they worked perfectly (and were so bite size and cute!). Tonight I’m making them again and also put some Brussels sprouts in there too. Fabulous recipe – thank so much for sharing! I have made these potatoes 4 times in 8 days. They are good hot and cold. They make a wonderful snack anytime. I have another batch in the oven right now. All my family and friends crave them! I’m so glad you and your family love them, Elaine! I am a potato junkie and can’t wait to try this. I love low maintenance recipes like this that complete pretty much any meal! WOW! I printed this off to try ASAP! I’m so glad you liked them, Betty! Surf and Turf sounds delicious, too. Does it make a big difference if I use salted butter? It shouldn’t make any difference at all, Carrie. I just wouldn’t use any other salt as seasoning, since Parmesan cheese already is a bit salty. These look fantastic, and I LOVE that they are baked. My little picky eater would love these! Pinned! So glad you liked them Marsha! These look super delicious! My mom used to make a similar recipe, and they were so good. Definitely trying this soon! I am so excited to try these. Pinning! These look really good… I make something very similar to this and we love them. Looks so delicious! I want to try this for my family so we may watch Superbowl College Football on Thanksgiving day. I pinned! I live in rice-growing country, but…don’t tell anyone…I always turn to potatoes first. It really says something about this recipe when your husband requests dishes that will spark you to make the potatoes. Love that! I just made these and ate almost the whole pan by myself. I added minced garlic to the butter mixture. Outstanding recipe, especially for my vegetarian friends. I really like that you don’t have to boil the potatoes first. these were delicious! 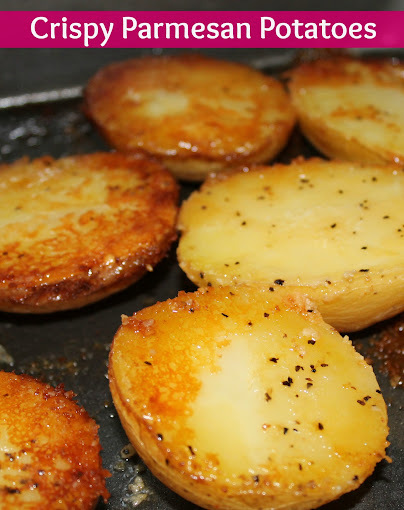 I can’t believe I never thought of it because I do something similar when I make homemade French “fries” – after I soak them I drizzle olive oil on a pan and sprinkle with salt and pepper and then roll the fries in them before baking. I loved these with the butter and parm! I didnt add any extra seasonings but I bet they’d be awesome with some thyme or crushed red pepper. So easy and versatile…definitely going to start making these more! I’m so glad you liked them so much, Torrey! If you do try them with other seasonings, I’d love to hear what you come up with. I have made this before they are so good . Everyone in my house loves them . They’re requested here so often, I think I can make them in my sleep! I’m glad you all love them, too. These look amazing! Adding to my to try list for sure! Thanks, Robin! Let me know how you like them if you get a chance to try them! Potatoes is one of my fsvorite,i will try this also looks sooi yummy!! This looks so good. Love them like this!